Install strip curtain doors on your commercial refrigerator, cooler, walk in freezer or other walls and doorways with this durable, steel mounting hardware. Simply attach with lag bolts, screws or anchors (not included). 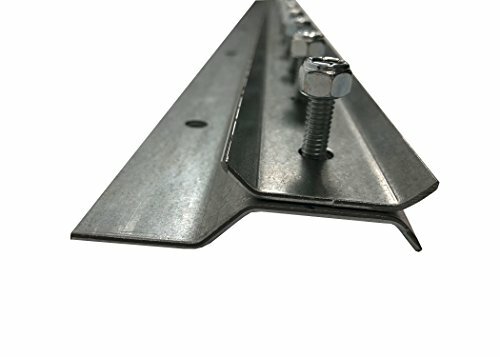 Cut the steel strip to the exact length needed with a metal saw blade or lay several brackets next to each other for wider width openings beyond 4 feet. Drill holes into the strip curtain material on 2-inch centers and mount onto bolts with the overlap indicated with installation instructions. Place 12-inch flanges over the curtain, lining up the holes with the mounting bolts and tighten nuts to hold the strip curtain in place. The flanges allow for quick replacement of one damaged strip curtain without unscrewing the bolts across the entire opening. Get your strip curtain doors up in no time with Strip Curtain Direct Mounting Hardware. Order yours today! View More In Refrigeration Equipment. If you have any questions about this product by Strip Curtain Direct, contact us by completing and submitting the form below. If you are looking for a specif part number, please include it with your message.